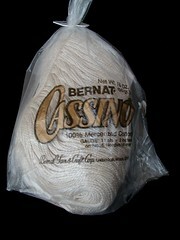 I was looking at some thread I have that I got at a thrift store I had three of the same cream thread by Bernat :Cassino. 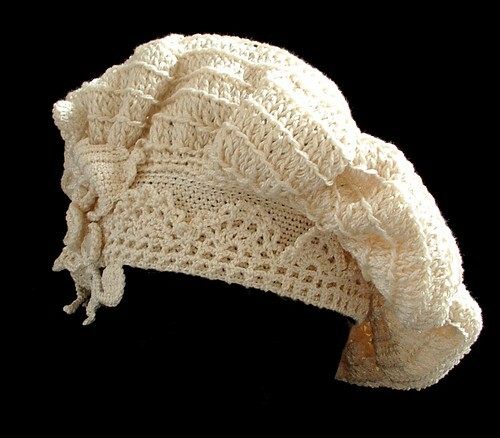 It was such a nice color and weight that I thought it would be perfect for an embellished tam. I used 3 sizes of hooks in the process of making this size H, G for the hat and a size 6 steel for embellishments and hat band. 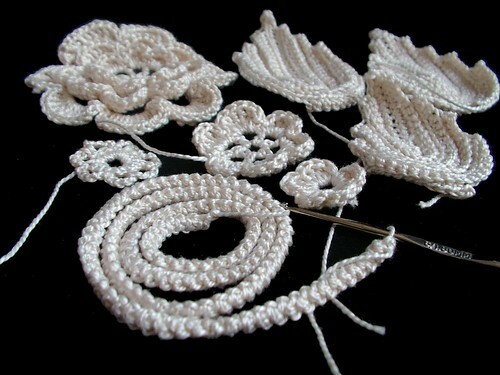 So I set to work on this, with out a pattern just crocheting what ever came into my head. I worked on it on and off . 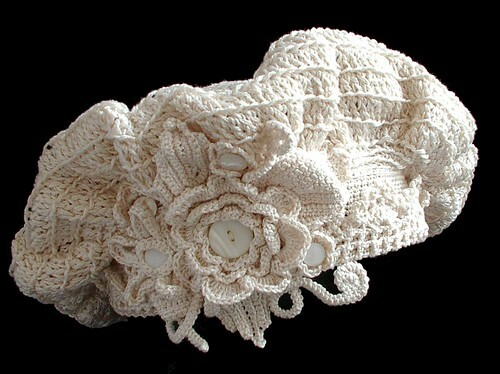 By bed time yesterday I had the hat made and all most all the flowers, leaves and vines done. I used Romanian cord for the vines if you don't know what Romanian cord is go to my tutorial on it and you can make it too. I made one more flower this morning. I spent the last 2 hours figuring out layout and stitching the embellishments on and added some antique mother of pearl buttons some are even antique ladies boot buttons. I just love boot buttons. There are five buttons total on the hat each button is in the center of a flower. For not having a pattern I think it came out well. Sometimes it is nice to just get an idea and go for it. I used every scrap of that thread that I had and got a pretty hat out of it. Your hat is gorgeous!! I love everthing about it. OMG...you did that without a pattern?!?!?!? You are so incredibly talented. Wow! It is amazing. I want one for me too! Your Tam is fantastic! You do such great work. You are really an inspiration to me! Sunshine, your creativity never ceases to amaze me, and pique my own curiosity and interest! This is BEAUTIFUL! You are an incredibly talented woman. I gotta make one! Beautiful work as always! 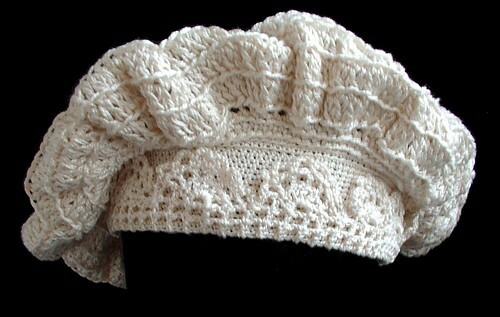 That tam turned out just adorable!! that tam is absolutely gorgeous!! I have just discovered this gorgeous piece of art. 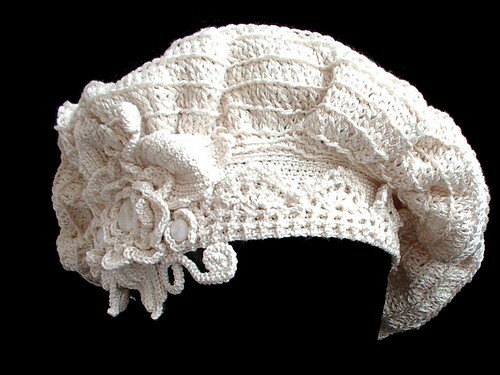 I am going to be a new grandmother, and am scouring the internet for little girl hats. Would you consider making this and allowing me to purchase it in a baby girl's size? 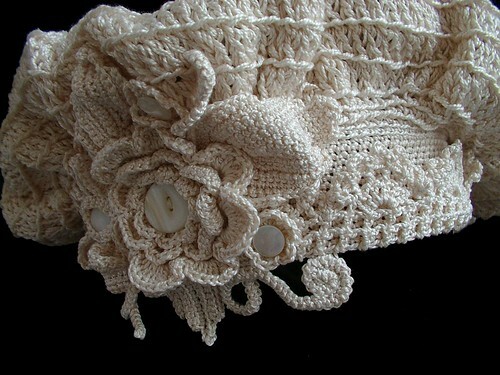 I am a novice crocheter, and am just amazed by this!